Manley Performance has been manufacturing the finest stainless steel valves for over 40 years. Manley valves have been the standard of the industry from their inception; a fact that still remains true even as we've shifted our focus and resources to the Sport Compact Market. Manley intake valves typically are built with our original "Pro-Flo" design which reduces the stem diameter in the fillet area for increased airflow but also less valve weight. In certain specific applications, Manley offers our "Extreme Duty" exhaust material. Our "Extremealloy" alloy offers more hot hardness and high temperature strength than our competitors' offerings. This alloy is ideal for extremely high boosted applications where the exhaust gas temperatures reach what seem like unthinkable levels. Manley offers an excellent array of shelf stock part numbers for numerous Sport Compact applications. Plus, with our exclusive Gen II program, our custom manufacturing ability is nearly limitless. 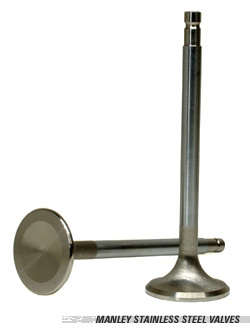 Please refer to the stainless valve Gen II section of our catalog for more details on how to order your custom valves.